In digital marketing, the cornerstone of optimizing a website is split testing, which means to conduct controlled, randomized experiments with the goal of improving a website metric, such as clicks, opt-ins, or sales. Split testing takes two different forms: A/B testing, a technique in which two versions of a page can be compared for performance, and multivariate testing, a testing method in which a combination of variables is tested at one time. During a split test, you split incoming website traffic between the original (control) page and different variations of the page. You then look for improvements in the goals you’re measuring (such as leads, sales, or engagement) to emerge so that you can determine which version performed best. You use split testing to test areas where you might be able to improve a measurable goal, such as your online checkout process. The test helps you try to determine what factors increase conversions, what factors deter conversions, and what can lead to an increase in orders. To run split tests, you need effective tools. To choose the right pages to test on your website, you rely heavily on your website analytics tool. This information here focuses on Google Analytics, a website analytics solution made available by search engine giant Google. This tool measures website, app, digital, and offline data to gain customer insights. Google Analytics has two pricing tiers: free and premium. For most businesses, the free version of Google Analytics is more than sufficient. Pricing for the premium version of Google Analytics starts in the six figures annually; this tier offers higher data limits, more custom variables, a dedicated support team, as well as other features. Visual Website Optimizer: An easy-to-use split testing tool. It allows you to run A/B and multivariate testing to optimize your website for increased conversion rates and sales. This paid tool has several pricing packages to choose from for individuals to large agencies. Unbounce: Gives marketers the power to build, publish, and test landing pages. It also offers A/B testing. It has several pricing tiers to choose from for entrepreneurs and enterprise-level businesses alike. Optimizely: One of the world’s leading experimentation platforms for websites, mobile apps, and connected devices. Optimizely makes customer-experience optimization software for companies, which gives businesses the capability to conduct A/B and multivariate testing. The company offers three pricing tiers. Make sure to integrate your testing tech tool with Google Analytics so that your Google Analytics reports reflect accurate data. 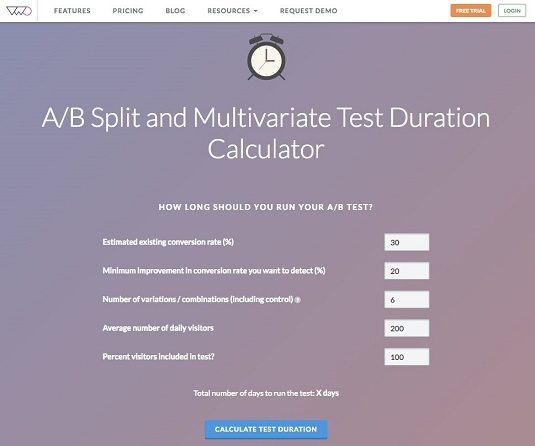 A test duration calculator is a simple calculator that determines how long you need to run your split test to get a reliable test result. You input data such as the existing conversion rate, the number of variations in the test, the amount of traffic your site gets, and more. The calculator then determines how many days to run this test to get a reliable result. A test duration calculator from Visual Website Optimizer. Not every page on your website needs to be tested or requires optimization. So why shouldn’t you test your worst-performing pages? When looking for pages to optimize, your job is to focus on opportunity pages, which are pages that will have the greatest impact on your goals. For instance, if you expect a 10 percent increase in conversions from your efforts, would you rather that lift be on a page converting at 50 percent or 5 percent? The one at 50 percent is an opportunity page. Further, your worst-performing pages don’t need a testing campaign; rather, they need an overhaul. The ship is sinking, and you don’t have time to hypothesize over what to do next; you need to make a drastic change that likely doesn’t need to be tested. Remember, in such a case, don’t test; implement! For the same reason that you don’t want to test the worst-performing pages, you also don’t need to test your nonconversion-oriented pages. These nonconverting pages include your About Us page or your “dead end” 404 page. However, optimizing 404 pages has proven to be useful in marketing. Even on that page, you should include an offer, a call to action, or some additional steps to keep the user engaged. You don’t need to test adding these elements to the page, however; just add content that meets your goals and then move on to more important pages that impact conversion. 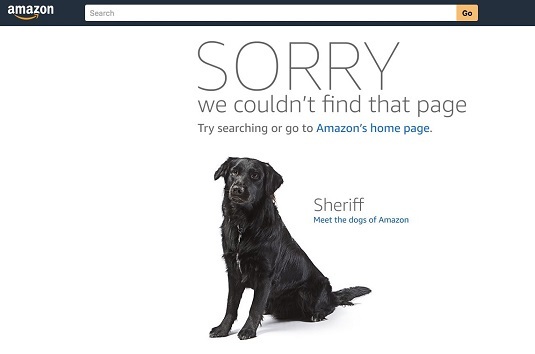 Amazon’s 404 page directs people to the Amazon home page or suggests continuing to search. 404 pages, like Amazon’s, should offer users a next step but they don’t need to be split tested. The final guideline you should follow when determining whether to split test a page is the page’s traffic. Look at the number of visits and of conversions that your page gets over the potential test period. Notice where traffic falls off considerably. You can easily identify your pages and their traffic numbers using Google Analytics. Examine the number of Unique Pageviews for pages under consideration for split testing. The best report to employ for this job in Google Analytics is in the Behavior suite. In Google Analytics, navigate to the Reporting section and then select the following: Behavior → Site Content → All Pages. The Pages report loads. From there, use the filter tool in Google Analytics to search for the specific pages you’re considering for a split test. After you gather the data from the Page report, you should contextualize the pages. You’ll always see a massive drop-off in page views (the total number of pages viewed by a user; repeated views of a single page are counted) after your home page. However, your home page is so far away from your main converting action that it doesn’t make sense to test. Now, if you see a massive drop from a product page to the checkout page, you know that something is wrong with your product page and that you need to optimize it, and that merits a split test. Does the page get enough unique visitors? Does the page get enough raw conversions? Does this page directly impact my goals? If indirect, how far away from the primary conversion action is the page? What’s the potential impact on your goal, such as for sales or leads? Qualifies that the page is worth using resources to test. Gives you an idea of whether testing will actually be useful. By determining which pages aren’t worth split testing, you can find the pages that merit testing.